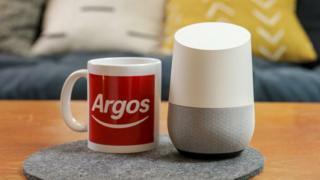 Catalogue retailer Argos has launched a "voice shopping" service to let people reserve products in a local store using a Google Home smart speaker. "This launch is step one and I don't expect to turn on the app and suddenly double our sales," Argos chief executive John Rogers told the BBC. Shoppers will still need to browse the catalogue or retailer's website to find the product they want. "We still distribute millions of catalogues to people's homes," said Mr Rogers. "We all know that the catalogue on the coffee table, as a means of browsing, is really good - and it's hard to replicate with today's technology." Argos is owned by supermarket giant Sainsbury's, which itself faces competition from Amazon as it expands its grocery delivery service. Mr Rogers said Argos sold thousands of devices powered by Amazon's Alexa voice technology, but the retailer does not have a voice app on the Alexa platform. "We do talk to all these players, whether it's Amazon, Google or Microsoft," Mr Rogers told the BBC. "We're taking the approach of trying and testing - we're dipping a toe in the water."